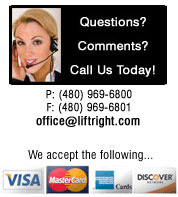 Liftright.com takes great strides to ensure that all of our customers have a safe and secure online experience with us. We consider the information you provided to us personal and confidential. Liftright.com do not sell, share or rent any of these information to other companies. We primarily use customers' information to fill orders, to contact purchasers for payment verification if needed, to improve our promotional efforts, and to statistically enhance operation of our site.